A Nigerian militant group on Saturday announced the deaths of seven workers from a construction company who had been taken hostage last month. The group, Ansar al-Muslimeen (widely known as Ansaru), released video stills of some of the bodies and blamed the deaths on a joint Nigerian-British military operation intended to free the hostages. There was no immediate word from those governments. The militants on February 18 claimed responsibility for the kidnappings of the seven construction workers taken from their office in northeastern Nigeria. Jordanian Foreign Minister Nasser Judeh greets U.N. peacekeepers after their release on the Syria-Jordan border Saturday. Twenty-one U.N. peacekeepers detained by Syrian rebels this week have been handed over to Jordanian authorities at the border with Syria, the Free Syrian Army told CNN Saturday. 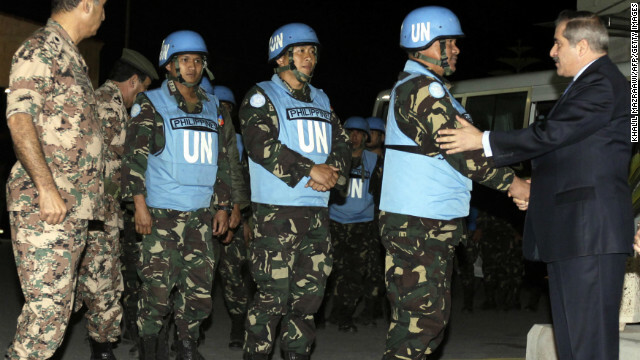 Rebels had detained the peacekeepers, identified by the Philippine government as Filipino, in a Syrian village near the Golan Heights. Syrian opposition coalition President Moaz al-Khatib says the rebels took the peacekeepers for their own safety due to fighting there. The peacekeepers reportedly are unharmed. Two people were killed and at least 15 injured Saturday in Cairo, officials said, as Egyptians in two rival cities took to the streets to vent their anger over court verdicts in a controversial case involving deadly riots at a soccer game last year. Health Ministry spokesman Ahmed Osman said one protester had been killed in violence outside the Semiramis Intercontinental hotel in downtown Cairo. He later confirmed a second death. Five others have been injured in the clashes by the hotel, he said. Another 10 are suffering smoke inhalation. A fire gutted the three-story building housing the Egyptian Football Association in a wealthy Cairo neighborhood, as soccer fans looked on. Next door, an exclusive club for policemen was also ablaze. 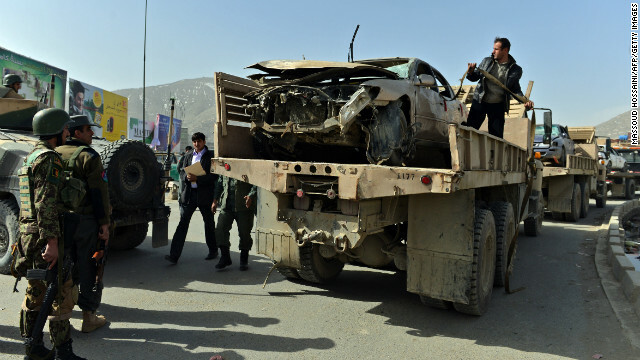 Afghanistan National Army soldiers try to remove a destroyed car at the site of a suicide attack next to the Defense Ministry in Kabul Saturday. A policeman sacrificed his life for the sake of others, embracing a suicide bomber in southeast Afghanistan on Saturday morning to dull the blast as it detonated, eyewitnesses said. The bomb killed the officer, Murad Khan, and eight minors between the ages of 7 and 17. An explosion rocked Kabul Saturday during a press briefing in Afghanistan by newly appointed U.S. Secretary of Defense Chuck Hagel, according to a CNN correspondent present. Those attending the briefing were moved to a safer location. The sound of other explosions could be heard a short time before the blast. Three eye witnesses said there was an explosion near the Afghan defense ministry, which is about half a mile from the headquarters of the International Security Assistance Force.